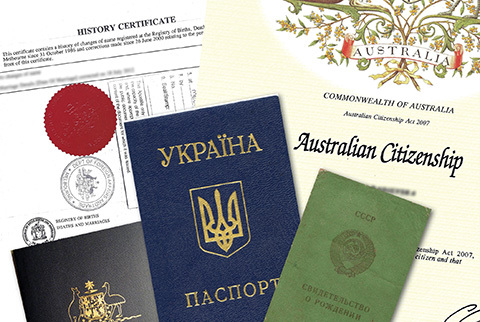 RADO Translations provide NAATI certified Ukrainian and Russian translations that are accepted in government and other official institutions across Australia and in the embassies of Ukraine and Russia. At RADO Translations we regularly work on personal document translations. We are fully aware of the importance of these documents and have substantial experience in translating official certificates and other similarly sensitive documents. It is of course necessary for the translation to be accurate and of high quality. All our translations are done by NAATI accredited translators at the Professional level in both Ukrainian and Russian languages, which means they are accurate, fast and, most of all, they will be accepted by any official body. The National Accreditation Authority for Translators and Interpreters (NAATI) is the national standards and accreditation body for translators and interpreters in Australia. Standard turnaround time for most 1-page certificates is 2 business days. We deliver express translation if required. In terms of the cost, we offer you the best combination of reasonable pricing and high quality. Our rates start at as low as $30 for apostille translation. The cost of documents that may vary in size (such as academic transcript) is based on the number of words and the complexity of the document. At RADO Translations we can help you save time and effort with obtaining an Apostille for your documents. If you need your document notarised by a Notary Public or Justice of Peace we can organise it for you as well. “We must complement RADO Translations for their efficiency and professionalism. We have been very impressed by the ease with which they provided translator service to us and the excellent documentation provided. We required a NAATI accredited Russian / Ukrainian / English translator to enable us to execute a Will of a person who died in Melbourne, Australia. The beneficiaries reside in Ukraine and Russia. In order to be able to distribute the gifts pursuant to the provisions of the will, we needed translations of Passports, Death certificates, Marriage certificates, Birth certificates, Bank account details, Bank documents confirming the account number belongs to the beneficiary. Your translations were most efficient, professional, prompt and reasonably priced. The exchange of scanned documents by email was quick and efficient and the final hard copy well presented. “Extremely friendly and professional service. They’re lovely over the phone and helped with some extra information we required. “Olena was one of translators that I’ve contacted, she bid the price of all other agencies; completed translation from emailed copy in one day and post it to me the same day. Translation performed on professional level. Oлена помогала нам с переводом и официальным заверением нескольких важных документов. Вся работа была выполнена ей в кратчайший срок и на очень высоком уровне. С большой уверенностью могу рекомендовать Олену, как профессионала высокого класса, что не мешает ей подходить к решению поставленных задач индивидуально и с душой.